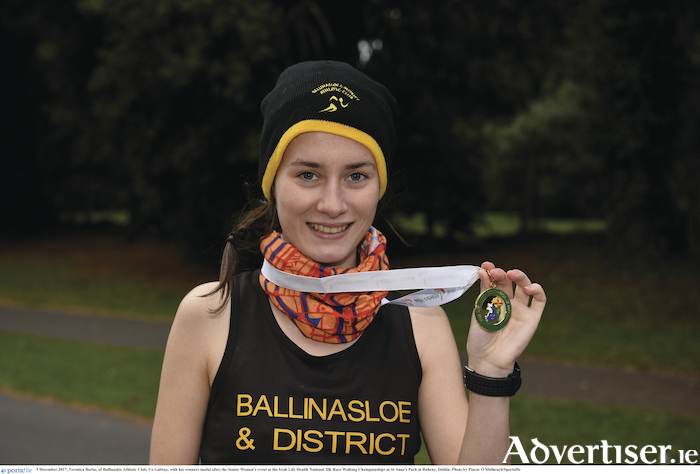 The county Galway athlete clocked 1:47:10 for victory at St Anne's Park in Raheny, Dublin, last weekend - the reward for an arduous training schedule. It is a huge achievement for Burke who pipped the hugely talented Irish international Kate Veale of West Waterford AC, who took second place. The second major event of the cross country season, the National Juvenile Uneven Ages, and Novice Cross Country Championships, will be held in Waterford Institute of Technology this Sunday, on what is a hilly but fair course. Several of Galway’s top juvenile clubs and athletes will look to secure national medals, including Tuam AC, whose U11 boys' team won silver last year. Individually, Sean Cotter of Craughwell AC will target a high placing at U15 level, as will Ben Ryan and William Fitzgerald, also of Craughwell, at U17 level. Their clubmate Caron Ryan will be fancied to run well in the U19 girls after a strong run at the National Juniors recently. Craughwell AC and Loughrea AC are beneficiaries after the latest round of sports capital grants, allocated by the Department of Sport. Craughwell AC received a grant of €72,000 towards an indoor athletics training hall and other facilities, which have been developed over the last three years, while Loughrea AC received a capital sum of €50,500 towards their facility at Bushfield which will assist improvements at the cross country running track. Brian Bruton of Galway City Harriers has been elected chairperson of the Galway Athletics County Board at its AGM in Craughwell. Other officers elected were: treasurer, James Lundon (Athenry ); and secretary, Gerry Carty (GCH ). The 2017 season review was excellent for Galway, with individual international appearances for Alanna Lally, fourth at the European U23 800m, Cillin Greene of GCH at the European U20 championships, Sean Breathnach in the shot putt on the Irish senior team, and Laura Shaughnessy at the UK v Ireland 10k match and in mountain running. The success of juvenile athletes was commended at the meeting, highlighted by the GCH U16s and juniors victories at the National Cross Country Championships, and the huge individual haul of medals by juvenile stars, such as Emma Moore, Cillin Greene, Jack Dempsey all of GCH, Loughrea’s Brendan Lynch, and Laura Cunningham and Chloe Casey of Craughwell. Athletics club membership is now at almost 4,000 in the county, with nearly 20,000 taking part in road races across the county during the year. And the traditional Christmas Day Goal Mile continues. It takes place at Dangan from 10am to 1pm in aid of Goal.